Citgo Petroleum Corporation (or Citgo) is a United States-based refiner, transporter and marketer of transportation fuels, lubricants, petrochemicals and other industrial products. Headquartered in the Energy Corridor area of Houston, it is majority-owned by PDVSA, a state-owned company of the Venezuelan government. 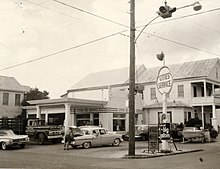 Cities Service station in Key West, Florida, in 1965. 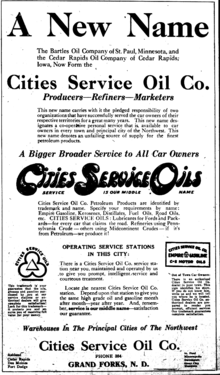 1922 newspaper ad promoting the new Cities Service Oils. The company traces its heritage back to the early 1900s and oil entrepreneur Henry Latham Doherty. After quickly climbing the ladder of success in the manufactured gas and electric utility world, Doherty in 1910 created Cities Service Company to supply gas and electricity to small public utilities. He began by acquiring gas-producing properties in the mid-continent and southwest. The company then developed a pipeline system, tapping dozens of gas pools. To make this gas available to consumers, Doherty moved to acquire distributing companies and tied them into a common source of supply. Cities Service became the first company in the mid-continent to use the slack demand period of summer to refill depleted fields near its market areas. Thus, gas could be conveniently and inexpensively withdrawn during peak demand times. In 1931, Cities Service completed the nation's first long-distance high pressure natural gas transportation system, a 24-inch pipeline 1,000 miles long from Amarillo, Texas to Chicago. A logical step in the company's program for finding and developing supplies of natural gas was its entry into the oil business. This move was marked by major discoveries at Augusta, Kansas, in 1914, and in El Dorado a year later. In 1928 a Cities Service subsidiary, Empire Oil & Refining, discovered the Oklahoma City field, one of the world's largest. Another participated in the discovery of the East Texas field, which, in its time, was the most sensational on the globe. Over three decades, the company sponsored the Cities Service Concerts on NBC radio. The long run of these musical broadcasts was heard on NBC from 1925 to 1956, encompassing a variety of vocalists and musicians. In 1944, it was retitled Highways in Melody, and later the series was known as The Cities Service Band of America. In 1964, the company moved its headquarters from Bartlesville, Oklahoma, to Tulsa. At the height of Cities Service's growth, Congress passed the Public Utility Holding Company Act of 1935, which forced the company to divest itself of either its utility operations or its oil and gas holdings. Cities Service elected to remain in the petroleum business. The first steps to liquidate investments in its public utilities were taken in 1943 and affected over 250 different utility corporations. At the same time, the government was nearing completion of a major refinery at Rose Bluff just outside Lake Charles, Louisiana, that would become the foundation of the company's manufacturing operation. Using designs developed by Cities Service and the Kellogg Co., the plant was dedicated only 18 months after groundbreaking. A month before Allied troops landed in France, it was turning out enough 100-octane aviation gasoline to fuel 1,000 daily bomber sorties from England to Germany. Government funding through the Defense Plant Corporation (DPC) also prompted Cities Service to build plants to manufacture butadiene, used to make synthetic rubber, and toluene, a fuel octane booster and solvent. In the years that followed, Cities Service grew into a fully diversified oil and gas company with global operations. Its green, expanding circle marketing logo became a familiar sight across much of the nation. During this time CEOs such as W. Alton Jones and Burl S. Watson ran the company. Cities Service Company inaugurated use of the Citgo brand in 1965 (officially styled "CITGO") for its refining, marketing and retail petroleum businesses (which became known internally as the RMT Division, for Refining, Marketing and Transportation). CITGO continued to be only a trademark, and not a company name, until the 1983 sale of what had been the RMT Division of Cities Service to Southland Corporation (now 7-Eleven Inc.). In 1982, T. Boone Pickens, founder of Mesa Petroleum, offered to buy Cities Service Company. Citgo responded by offering to buy Mesa, which was the first use of what became known as the Pac-Man take-over defense; i.e., a counter-tender offer initiated by a takeover target. Cities Service also threatened to dissolve itself by incremental sales rather than being taken over by Mesa, stating that it believed that the pieces would sell for more than Pickens was offering for the whole. Cities Service Company located what they thought would be a "white knight" to give them a better deal and entered into a merger agreement with Gulf Oil Corporation. Late in the summer of 1982, Gulf Oil terminated the merger agreement claiming that Cities Service's reserve estimates were over-stated. Over fifteen years of litigation resulted. (For a more detailed discussion of the Cities Service vs. Gulf Oil litigation, see Gulf Oil#Demise.) Ironically, two years later, Gulf Oil itself would collapse as a result of a Pickens-initiated takeover attempt. In the chaos that ensued after Gulf Oil's termination of its deal, Cities Service eventually entered into a merger agreement with, and was acquired by, Occidental Petroleum Corporation—a deal that was closed in the fall of 1982. That same year, Cities Service Company transferred all of the assets of its Refining, Marketing and Transportation division (which comprised its refining and retail petroleum business) into the newly formed Citgo Petroleum Corporation subsidiary, to ease the divestiture of the division, which Occidental had no interest in retaining. Pursuant to an agreement entered into in 1982, Citgo and the Citgo and Cities Service brands were sold by Occidental in 1983 to Southland Corporation, original owners of the 7-Eleven chain of convenience stores. Fifty percent of Citgo was sold to Petróleos de Venezuela, S.A. (PDVSA) in 1986, which acquired the remainder in 1990, resulting in the current ownership structure. In September 2010, in connection with the centennial of its original owner, Cities Service Company, Citgo unveiled a new retail design. Within five years, Citgo planned for all locations to display the new street image. In October 2010, then President of Venezuela, Hugo Chávez, announced the intention to have PDVSA sell its Citgo subsidiary calling it a "bad business" and citing low profits since 2006. The minimum sale price was set at 10 billion US dollars; however, PDVSA has been unable to find a buyer at that price. It was confirmed in January 2015 that Citgo would not be sold, but rather bonds were sold by Citgo to give a dividend to PDVSA. The Bonds sold included a $1.5bn five-year bond and a $1.3bn term loan to be fully repaid in three and a half years. In November 2017, six executives working for Citgo, including five American citizens, were arrested while attending a meeting at the headquarters of PDVSA in Caracas, and as of January 2019 remained in prison without consular access. Other Venezuelan oil executives were arrested in what was seen as a purge designed to bolster more economic power behind President of Venezuela, Nicolás Maduro, Asdrúbal Chávez, cousin of late Venezuelan president Hugo Chávez, was installed as president of Citgo in November 2017. Citgo also has a much earlier connection to Venezuela, dating to the turn of the 20th Century. Predecessor Warner-Quinley Asphalt's principal business was competition to the "Asphalt Trust" by means of a bitumen resources concession it held in Venezuela. Following the death of Hugo Chávez in 2013, his successor Nicolás Maduro oversaw the worst crisis in Venezuela's history. The destabilized economy resulted in hyperinflation, an economic depression, shortages in Venezuela and drastic increases in poverty, disease, child mortality, malnutrition, and crime. As a result of the crisis, Venezuela's debt to China and Russia – two political allies – increased. Due to the financial burden of this debt, Venezuela offered Citgo as collateral for Russian debt in 2016, raising the possibility that the Russian government could own Citgo due to Venezuela's high risk of default. In July 2018, Citgo president Asdrúbal Chávez had his work and tourist visas revoked by the United States and was ordered to leave the country within thirty days. Texaco sold some Citgo gas stations in the southeast when Chevron gained exclusive rights to the Texaco brand name in the U.S. in June 2006. On September 27, 2006, the 7-Eleven chain of convenience stores announced its 20-year contract with Citgo was coming to an end and would not be renewed. 7-Eleven spokeswoman Margaret Chabris said "Regardless of politics, we sympathize with many Americans' concern over derogatory comments about our country and its leadership recently made by Venezuela's president. Certainly Chavez' position and statements over the past year or so didn't tempt us to stay with Citgo." Citgo launched a national ad campaign in the fall of 2006 emphasizing the company's corporate social responsibility. National television ads featuring Joe Kennedy also aired through February 2007 featuring ordinary Americans thanking Citgo and Venezuela for providing discounted heating oil to low-income people. During the 2000s, Citgo faced several legal actions over the operation of its Corpus Christi, Texas oil refinery. In 2007, it was convicted of a violation of the Clean Air Act for operating an oil-water separator without proper pollution-control equipment. It was found not guilty of a charge of emitting illegal levels of benzene into the environment. In 2009, a fire at the alkylation unit of the same plant resulted in the release of toxic hydrofluoric acid and the injury of two workers, one with severe burns. In February 2011, the company was fined over $300,000 for the incident. Citgo has been cited by environmentalists for using crude oil from the Amazon region, at its Corpus Christi and Lake Charles refineries in particular. In 2015, the Corpus Christi refinery was processing 16,337 barrels of crude oil per day from the Amazonian rainforest. In a 2016 deal, Venezuela offered Russia 49.9% of Citgo as collateral for a $1.5 billion loan. Due to the poor state of Venezuela's economy, which includes a high risk of default, it is possible the Bolivarian Government of Venezuela may give Citgo to Rosneft, Russia's government-run oil company. Both Republicans and Democrats in the United States urged oversight on this deal, describing Citgo's sale to Russia as a risk to the national security of the United States. In 1901, the Warner-Quinlan Asphalt Company purchased several properties in Linden for use as an asphalt manufacturing plant at the Tremley Point development, later a part of the planned Montgomery Terminal. In 1937, Cities Services took over substantially all assets of Warner-Quinlan under a bankruptcy reorganization, including the Linden plant. The plant suffered several major fires and explosions. A tank exploded in July 1914, and two major fires occurred at the plant, one in June, 1921 (still under Warner-Quinlan), and another in October, 1938 (under Cities Services). The 1921 fire destroyed almost the entire plant. Citgo has sponsored several motorsport ventures. The company was a sponsor of the #21 Wood Brothers racing team in NASCAR for many years, with drivers such as Michael Waltrip, Elliott Sadler, Kyle Petty, Neil Bonnett, Morgan Shepherd and Dale Jarrett. They also sponsored the #99 Roush Racing team of Jeff Burton from late 2000 until pulling out of the sport in 2003. The company sponsored the Citgo Pontiac-Riley of Venezuelan car driver Milka Duno in the Rolex Sports Car Series. Duno has three overall wins in the Rolex Series and finished second at the 2007 24 Hours of Daytona, becoming the highest-finishing female in the history of the famous race. Midway through the 2007 season, Citgo sponsored the #23 SAMAX Motorsport entry in the IndyCar Series for Duno. In 2008 and 2009 this sponsorship went with Duno to the Dreyer & Reinbold Racing #23 entry. She took the sponsorship to Dale Coyne Racing in 2010. Citgo is the major sponsor of Ernesto Viso of KV Racing (2012) and Andretti Autosport (2013). Citgo is a major sponsor of the Bassmaster Fishing Tournaments, and is also the sponsor of a charity golf tournament benefiting the Muscular Dystrophy Association (MDA). The company's relationship with the MDA goes back to its 1983 purchase by Southland, an existing MDA sponsor. Citgo is MDA's biggest corporate sponsor, and its executives have appeared on the Jerry Lewis MDA Telethon. Consistent with its former sponsorship of the Boston Marathon, Citgo has for the past few years sponsored an elite level multisport team that competes in both adventure racing and triathlon events throughout the United States. The logo is seen nationally on the Boston Citgo sign during televised Boston Red Sox games at Fenway Park and locally through replica signs at other baseball grounds. In 2016, the Boston Landmarks Commission granted preliminary landmark status to the sign to study whether the sign should receive historic preservation protection as a Boston Landmark. Citgo has its headquarters in the Energy Corridor area of Houston, Texas, United States. Before it was headquartered in Houston, Citgo had its headquarters in Tulsa, Oklahoma. In 2003, the Oklahoma governor Brad Henry met an executive of Citgo to discuss possible incentives that would keep the Citgo headquarters in Oklahoma. For eight months the company debated whether to move its headquarters or to keep its headquarters in Oklahoma. In 2004, the company announced that its headquarters were moving to Houston. At that point the company had not decided which location in Houston would have the headquarters. The company wanted 300,000 square feet (28,000 m2) of office space to house 700 employees. Citgo considered the 1500 Louisiana building in Downtown Houston, the Williams Tower in Uptown Houston, the BMC Software headquarters complex in Westchase, and the Aspentech Building in the Energy Corridor. In June of that year the company signed a lease in the five-storey Aspentech building so it could serve as a headquarters. In September 2004 the company began moving its headquarters, and by September 24 Citgo had already relocated 150 employees to the Energy Corridor offices. ^ Weaver, Bobby D. (2009). Cities Service Company. Encyclopedia of Oklahoma History and Culture. Oklahoma Historical Society. ISBN 978-0941498753. Archived from the original on 2009-01-02. Retrieved 2008-08-14. ^ "Citgo 11.5% of 2017 Prospectus". Scribd. Archived from the original on 2015-04-02. Retrieved March 17, 2015. ^ Ulmer, Alexandra; Parraga, Marianna (July 20, 2017). "Exclusive: Russia, Venezuela discuss Citgo collateral deal to avoid U.S. sanctions - sources". Reuters. Retrieved 25 July 2017. ^ "Henry L. Doherty". Encyclopædia Britannica. January 2, 2019. Retrieved 2019-01-30. ^ "Our Story". Citgo. Retrieved 30 January 2019. ^ Seba, Erwin (September 1, 2010). "CITGO Launches New Retail Design". CSP. Retrieved 2012-04-30. ^ Lisanti, Linda (November 1, 2010). "A Centennial Celebration". Convenience Store News. Archived from the original on 2010-12-19. Retrieved 2012-04-30. ^ Pretel, Enrique; Andres, Frank; Daniel, Jack (October 26, 2010). "Chavez calls Venezuela-owned Citgo bad business". Reuters. Retrieved 2011-04-11. ^ Tovar, Ernesto J (October 27, 2010). "Citgo was impacted by sale of assets and financial aid to PDVSA". El Universal. Caracas. Archived from the original on 2012-10-02. Retrieved 2011-04-11. ^ Crooks, Nathan; Rodriguez Pons, Corina (October 27, 2010). "PDVSA Facing Tough Sale of Citgo, Minister Says". Bloomberg Businessweek. Retrieved 2011-04-11. ^ Dezember, Ryan; Sider, Alison (January 20, 2015). "Plug Pulled on Venezuela's Sale of Citgo". The Wall Street Journal. Retrieved 2015-03-17. (Subscription required (help)). ^ "PdV pledges 100pc of Citgo in debt transaction". Argus Media. February 11, 2015. Retrieved 2015-03-17. ^ "Venezuela's Citgo and the revolution's Praying Mantis School of Business". Financial Times. January 29, 2015. Retrieved 2015-03-17. (Subscription required (help)). ^ Holland, Steve (November 22, 2017). "Detained Venezuelan-U.S. Citgo executives to be tried as 'traitors': Maduro". Reuters. Retrieved 12 January 2019. ^ Regan, Trish (January 11, 2019). "Trish Regan reveals the names of US hostages being held captive in Venezuela". Fox News. Retrieved 13 January 2019. ^ Rosati, Andrew (November 22, 2017). "Citgo Arrests Tighten Maduro's Grip on Venezuela's Oil Economy". Bloomberg News. Retrieved 23 November 2017. ^ "Venezuela taps Chavez cousin as new Citgo president after arrests". Reuters. November 22, 2017. Retrieved 23 November 2017. ^ "Moody's: Political risk poses major challenges to credit in Latin America" (Press release). Moody's Investors Service. August 29, 2017. Archived from the original on 2017-08-30. Retrieved 2017-08-30. ^ Corrales, Javier (March 7, 2013). "The House That Chavez Built". Foreign Policy. Retrieved 6 February 2015. ^ Scharfenberg, Ewald (February 1, 2015). "Volver a ser pobre en Venezuela" [Becoming poor again in Venezuela]. El País. Madrid. Retrieved 3 February 2015. ^ Herrero, Ana Vanessa; Malkin, Elisabeth (January 16, 2017). "Venezuela Issues New Bank Notes Because of Hyperinflation". The New York Times. Retrieved 17 January 2017. (Subscription required (help)). ^ "Chamber of Commerce: 80% of Venezuelans are in poverty". El Universal. April 1, 2016. Archived from the original on 2016-04-04. Retrieved 4 April 2016. • Gillespie, Patrick (December 12, 2016). "Venezuela shuts border with Colombia as cash crisis escalates". CNNMoney. Retrieved 17 January 2017. • Gillespie, Patrick (April 12, 2016). "Venezuela: the land of 500% inflation". CNNMoney. Retrieved 17 January 2017. • Rosati, Andrew (January 11, 2017). "Venezuela's Economy Was the Worst Performing of 2016, IMF Estimates". Bloomberg News. Retrieved 17 January 2017. ^ Batiz, César (July 18, 2018). "Extraoficial: Autoridades de Estados Unidos anularon la visa de Asdrúbal Chávez" [Unofficial: US authorities annulled Asdrúbal Chávez's visa]. La Patilla (in Spanish). Retrieved 2018-07-18. ^ Koenig, David (September 28, 2006). "7-Eleven Drops Citgo As Gas Supplier". The Washington Post. Associated Press. ^ "Citgo To Gush About Its Charitable Side". Adweek. October 25, 2006. Archived from the original on 2007-09-27. Retrieved 2007-04-04. ^ Birnbaum, Jeffrey H.; Mufson, Steven (February 24, 2007). "Is Citgo Program for Poor, or for Chávez?". The Washington Post. ^ Clanton, Brett (June 23, 2007). "Citgo trial on dirty air tests federal law". Houston Chronicle. Retrieved 2011-04-11. ^ Seba, Erwin (June 27, 2007). "Citgo found guilty of violating U.S. Clean Air Act". Reuters. Retrieved 2011-04-11. ^ Seba, Erwin (July 19, 2009). "Citgo Corpus refinery alky unit shut after fire". Reuters. Retrieved 2011-04-11. ^ Seba, Erwin (July 20, 2009). "Fire still burns at Citgo Corpus Christi refinery". Reuters. Retrieved 2011-04-11. ^ McFarland, John (December 10, 2009). "Feds urge new safety changes at Corpus Christi refinery". The Dallas Morning News. Associated Press. Retrieved 2011-04-11. ^ Seba, Erwin (February 24, 2011). "Citgo fined for 2009 Corpus Christi blast, fire". Reuters. Retrieved 2011-04-11. ^ "From Well to Wheel: The Social, Environmental, and Climate Costs of Amazon Crude". Amazon Watch. September 2016. Retrieved 30 January 2019. ^ "New York and Marine Terminals; the Tremley Site Development - Article II". The Wall Street Journal. September 27, 1912. p. 2. Retrieved 2018-02-26 – via Newspapers.com open access. ^ "Warner Quinlan Plan Confirmed". The Brooklyn Daily Eagle. August 25, 1937. p. 21. Retrieved 2018-02-26 – via Newspapers.com open access. ^ "Fatal Explosion of Oil Tank". The Courier-News. Bridgewater, New Jersey. July 29, 1914. p. 1. Retrieved 2018-02-26 – via Newspapers.com open access. ^ "Huge Oil Blaze at Linden Seen Plainly Here". The Central New Jersey Home News. July 19, 1921. p. 1. Retrieved 2018-02-26 – via Newspapers.com open access. ^ "$3,000,000 Jersey Oil Plant Burns". Asbury Park Press. July 19, 1921. p. 1. Retrieved 2018-02-26 – via Newspapers.com open access. ^ "Soaking Rain Forces Submerged Oil to Surface Adding to Troubles of Those Fighting Asphalt Plant Fire". The Courier-News. July 20, 1921. p. 1. Retrieved January 30, 2019 – via Newspapers.com open access. ^ "New Jersey 'Oil Village' is Beset by Conflagration". Valley Morning Star. Harlingen, Texas. October 13, 1938. p. 8. Retrieved 2018-02-26 – via Newspapers.com open access. ^ "Venezuela state oil company gave cash to Trump inauguration". BBC News. April 19, 2017. Citgo Petroleum, a US-based subsidiary of the Venezuelan state-owned oil company, is named in papers filed with the Federal Election Commission. ^ "Contact Us." Citgo. Retrieved on November 18, 2009. ^ "Governor, Citgo exec to meet to discuss possible incentives". The Journal Record. Tulsa. August 15, 2003. Retrieved February 3, 2010. ^ Moreno, Jenalia; Sixel, L.M. (May 1, 2004). "Citgo moving headquarters to Houston as Tulsa loses bid". Midland Reporter-Telegram. Hearst News Service. Retrieved January 30, 2018. ^ Moreno, Jenalia; Sixel, L.M. (May 1, 2004). "Citgo moving headquarters to Houston as Tulsa loses bid". Hearst News Service. Retrieved January 30, 2019. ^ Sarnoff, Nancy (June 8, 2004). "Citgo chooses west Houston Energy Corridor digs". Houston Chronicle. Retrieved January 30, 2019. ^ Droege, Tom (July 9, 2004). "Citgo prepares for move". Tulsa World. Retrieved January 30, 2019. ^ Moreno, Jenalia (September 24, 2004). "Houston-bound Citgo eager to get in growth mode". Houston Chronicle. p. Business 9. Retrieved January 30, 2019.